Because of their compact size, Rioned's combination units are often used in places where larger vehicles struggle to gain access. For example, for emptying oil and grease traps, basements and cleaning badly blocked drains and sewers. Other than accessibility, a small jet-vac unit also has economic benefits because the operating costs are considerably lower. Rioned offers its customers a family of basic concept vehicles which can be configured to suit a customer’s exact requirements by making a selection from the handy range of options. The UniCom is one of the variants with a tank capacity of 1,500 litres (1,000 litres for dirty water and 500 litres for clean water). Its contemporary design makes this combination unit a true all-rounder. Its big brother, the FlexCom, comes with a tank capacity of 3,750 litres as standard. 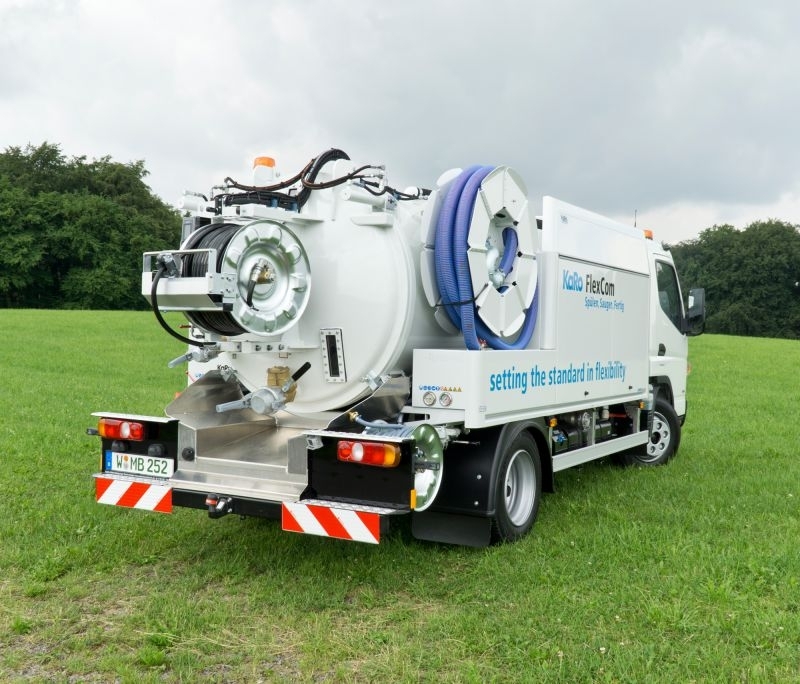 And we have even developed an off-road solution for stop-at-nothing sewer cleaners: the UrbanCombi, which is based on a Ford Ranger and features a 1,200 litre tank. Thanks to its height of just 1.83 metres, this vehicle is low enough to access parking garages or other locations with a low roof clearance. In recent years, we have seen a strong increase in demand for jet-vac units. We have responded by putting two new production and assembly halls into operation as part of Project2020. More information is available here. 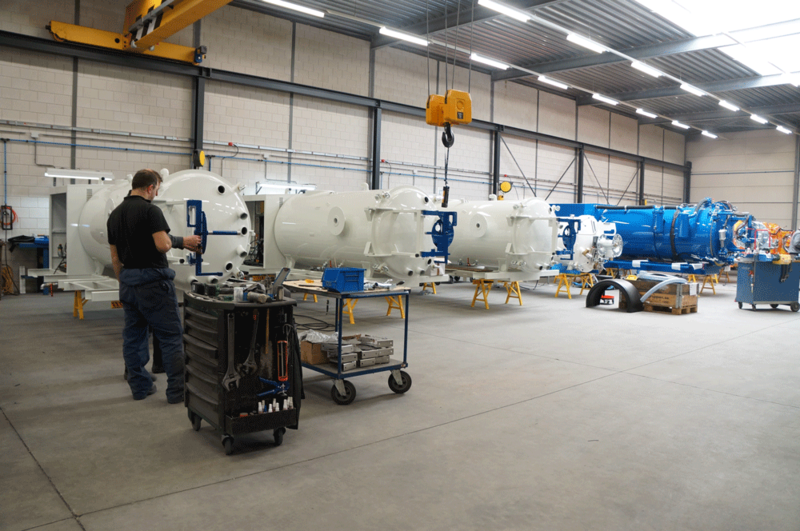 This expansion will allow us to satisfy increased international demand for our small combination jet-vac units. We also see a strong increase in demand in neighbouring countries such as Germany. Rioned collaborates successfully with sister company Karo in this segment. In these countries, the combination units on a 7.5 tonne chassis (e.g. the Fuso Canter) are particularly popular because a normal car driver’s license is adequate in most cases. In addition to the standard concepts, we also offer models that are specially built to customer specifications. The combination unit built for KSR Raue is a good example. KSR Raue is a German company that mainly specialises in camera inspection. However, they also set up a sewer cleaning division within the company not so long ago. And this division is growing rapidly. The FlexCom unit displayed on Rioned's stand during the IFAT exhibition attracted Mr Raue's interest. He immediately understood the benefits for his business. Rather than having to wait for other companies to clean sewers for them, they would be able to handle all aspects of the job themselves. A jet-vac combination is the ideal tool in this situation. Cleaning sewers is a physically demanding job, so many companies prioritise good ergonomics and accessories that allow their employees to adopt a healthy posture when working. A suction hose guide significantly reduces the level of physical stress. This accessory completely eliminates the need to “drag’’ the heavy suction hose off the reel. Rather than resting on the operator’s shoulders, the suction hose unrolls from above when this guide is used. The swivelling reels and control buttons are also positioned at an ergonomic height for maximum convenience when working. Click here to see the suction hose guide in action. Would you like more information about our combination units? Please visit the website or contact us.